Very Beautiful Marine Home Decorative Nautical Handmade Brass Combo Table Top Sand Time And Marine Camping Functional Compass , High Magnification Brass Tube Telescope Article "The Chess Maker"
All our products are specially designed by the experts utilizing best grade raw material and cut edged technology as per the specifications mentioned by their valuable patrons. 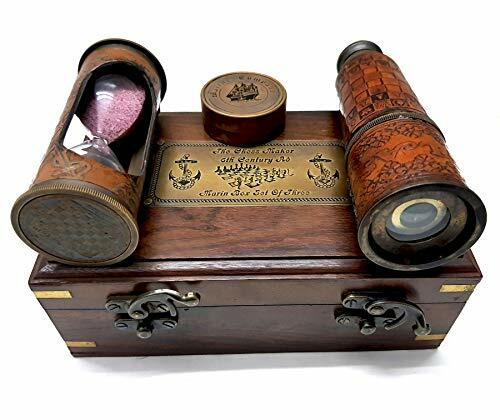 Box Size: (Length-7.25'", Width-.5'', Height-4.25"), Compass:2", Sand timer:5", Telescope:16.5", 1.75"
If you have any questions about this product by collectiblesBuy, contact us by completing and submitting the form below. If you are looking for a specif part number, please include it with your message.